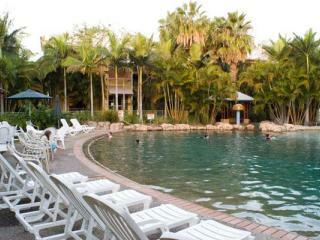 Centrally located in Mermaid Beach, Diamond Sands Resort is within walking distance to the beach and situated close to Broadbeach's popular shopping precincts and cosmopolitan restaurants. This low rise Gold Coast accommodation offers guests a choice of self contained 1, 2 and 3 bedroom apartments set in lush tropical landscaped gardens that feature a lagoon pool with sandy beach, spa and water features. This is the perfect location for a family holiday!